HBA queue depth limit. This indicates how many I/Os can be in-flight to all of the devices on a single HBA at once. HBA Device queue depth limit. This indicates how many I/Os can be in-flight to a given single device at once. Virtual SCSI adapter queue depth limit. This indicates how many I/Os can be in-flight to all of the disks on a single virtual SCSI adapter at once. Virtual device queue depth limit. This indicates how many I/Os can be in-flight to a given single virtual disk (or RDM) from a guest at once. So what about protocol endpoints? Let’s review quickly what they are. ESXi has device and path limitations (256 devices/1,024 logical paths in ESXi 6.0 and earlier, and those number doubled in 6.5). So presenting a VVol to a host in a normal way would very quickly exhaust available paths and devices. So it needed to be done in a different way. So virtual volumes use the concept of an administrative logical unit (ALU) and a subsidiary logical unit (SLU) (more info can be found here in a SAM-5 draft). An ALU is a device that has other devices accessed through it as sub-LUN. Kind of like a mount point. A SLU is one of those sub-LUNs–it is only accessible via an ALU. A protocol endpoint is a ALU. A VVol is a SLU. So a PE would have a LUN ID of let’s say 244 and a SLU “bound” to it would have a LUN ID of 243:4 for instance. Unlike with standard volumes, VMware supports much higher LUN addressing for SLUs (up to 16,383 or 0x3FFF). So what this means you can have up to 16,383 VVols bound to a single PE. So a lot of VVols! Which then begs the question: Will my PE be a performance bottleneck? All of the I/O for those VVols go to the PE and then are dealt with by the array. So the multi-pathing and queue depth limits are set on the PE. Let’s take a look at how queue depth limits work with PEs. So first off, the storage array queue depth limit depends on the array, so ask your vendor. The FlashArray doesn’t have one, so any possible bottleneck on that front would be in ESXi (or eventually the array itself). From the guest perspective, nothing changes. PVSCSI settings and queues are identical to what happens with VMs on VMFS. So refer to my earlier post on that. For standard volumes (VMFS or RDMs) the actual queue depth limit (called DQLEN) is calculated from the minimum of two values. and The HBA device queue depth limit and Disk.SchedNumReqOutstanding. The DSRNO setting for a standard device defaults to 32. In ESXi 6.0 and earlier this could be increased up to 256. In ESXi 6.5 this can be set to a maximum of whatever the current HBA device queue depth limit is. Protocol endpoints do not default to 32. They default to 128 and this setting is controlled with a new setting called Scsi.ScsiVVolPESNRO–this is a host-wide setting. If a given PE’s PESNRO is manually overridden, it will ignore this value from that point on, as the manual setting will be observed. So, I need to up my HBA device queue depth limit, which requires a reboot. This time it works and my ” No of outstanding IOs with competing worlds” is up to 256. So the point is, that the number of outstanding I/Os can be set very high for a protocol endpoint. Do I need more than one PE? Well this is really up to your storage vendor, and of course it depends on the underlying capabilities of a single PE. So, for the FlashArray instance where the physical device (PE) isn’t a bottleneck on the storage side, do I need more than one? This is a fancy way of saying if it takes a certain amount of time to do a task, take a certain duration of time and divide it by the the task time and that is how many times it can be done in that specified duration if done in a serial fashion. Let’s take the fast food restaurant example. If it takes a customer 1 minute to be served, the store can help 60 customers in an hour (60 minutes/1 minute). This is the case of one register. So. 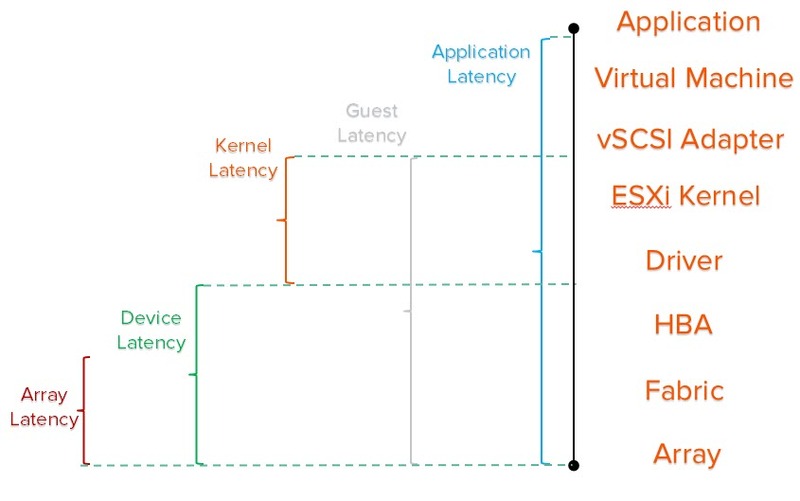 Let’s look at this from a storage latency perspective. Let’s say my average latency is 1.0 ms. I would usually expect it to be half that or even less, but let’s be conservative and say 1. There are 1,000 milliseconds in a second. So, 1,000/1 is 1,000. So this means with one outstanding I/O, I can do 1,000 IOPS. But with let’s say 256 outstanding I/Os I can therefore do 256,000 IOPS to that single PE from that host. Each host has it’s own queue. And a PE can be set much higher than 256. So there can be quite the parallelism from ESXi. With 4,096, this math works out to 8,192,000 IOPS per PE. This is all somewhat theoretical at this point, just basing it off some early testing and simply running the numbers. But, I’d say at least for the FlashArray one PE per array should be fine. I will update this as I do more testing–look for my best practices document for VVols close to our actual GA. Presumably using FlashArray, more than one PE won’t actually cause any issues either? I know this slightly off topic for this post, but will there be an easy process of transitioning from typical LUN based datastores to a VVOL approach with PURE? Thanks man, love your website. You’re welcome! Thank you! Glad you like it. Yup, to move a VM from VMFS to VVols you just use Storage vMotion. Nice and simple.